January 12 marks the 64th birthday of Haruki Murakami, a novelist whose work I enjoy because it’s original, funny, surreal, and surprising. Read an excerpt from the brilliant, charming, funny “Heigh Ho” at The Paris Review here. Being able to converse with cats was Nakata’s little secret. Only he and the cats knew about it. People would think he was crazy if he mentioned it, so he never did. Everybody knew he wasn’t very bright, but being dumb and being crazy were different matters altogether. It wasn’t so unusual, after all, to see old folks talking to animals as if they were people. But if anyone did happen to comment on his abilities with cats and say something like, “Mr. Nakata, how are you able to know cats’ habits so well?” he’d just smile and let it pass. “Heigh Ho” by Haruki Murakami is also found in his novel Kafka on the Shore, available at Amazon.com. 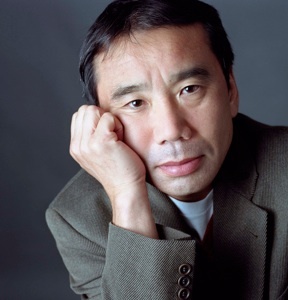 Wishing you many more happy birthdays, Mr. Murakami!